Pump Suction Systems eBook | Triangle Pump Components Inc. Complete and submit the form below to download the Triangle Pump Suction Systems eBook. Reciprocating pumps are often subject to suction system issues. Some of them emanate from a lack of maintenance and are preventable. Others, however, are caused by wear and tear which can be mitigated upon early detection. 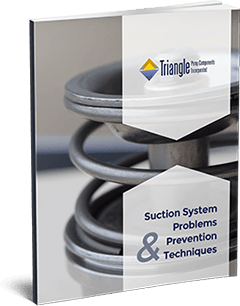 In this eBook, you will learn about the most common setbacks encountered while working with pump suction systems and solutions to prevent them.